June 18 was the bicentennial of the Battle of Waterloo and Europe is abuzz (at least western Europe) with a major reenactment event occurring this weekend (they are even live-streaming it). There is no doubt of the importance of the battle to history, but its importance remains today. It cemented Britain’s position in the world for the next hundred years and laid the foundations for Europe as we now it today. It represented the defeat of the ideals of revolutionary France, much to the relief of monarchists across Europe. Time discussed the importance of the battle, while The Telegraph provided several great stories on the event, including advocating the study of the battle by students. Despite such major subsequent events in military history, as both World Wars, the Cold War, and the current War on Terror, why do we still gravitate to Waterloo? One reason is because of its importance to the study of warfare. Waterloo ended a long period of conflict between Napoleonic France and the rest of Europe not under his control. His leadership abilities, as well as those of Wellington and Blucher influenced the study of warfare and the thinkers of military history and strategy for years to come (i.e. Napoleonic tactics), which were used in subsequent wars in America, especially the Civil War. Waterloo was such a stunning victory for the Allies over a foe that, until his ill-fated invasion of Russia, had largely been undefeated that understanding how Napoleon was defeated was viewed as essential to future commanders for learning how to overcome odds and achieve victory. Waterloo’s paving of the way towards our modern understanding of Europe cannot be ignored. It is a perfect example of international cooperation to defeat a common enemy, as Prussian and British forces united to beat the French and save western Europe. As Time pointed out in their article, it played a role in the eventual conceptualization of NATO and the UN, as Wellington’s army consisted of Prussians, British, the Dutch, and other smaller German states, coalesced into a grand alliance. While not the first example of such alliances in warfare, it is one of the more important because of the level of change the outcome of the battle had on European history and geography. Finally, Waterloo seems to fascinate us because it is one of the last examples in military history of a major pitched battle of forces standing shoulder to shoulder across a field in brightly colored uniforms. Historical wargamers remain enamored with the Napoleonic period, with one man fighting the battle in 6mm (you can view a video of it here). It is one of the last, if not the last, major battle involving flintlock muskets, as technological changes coming by the mid-19th century would render the tactics in the battle obsolete, though leaders still used them, with deadly results (i.e. American Civil War). As Europe reflects on 100 years since World War I, the next major conflagration to consume the continent, they reflect on the battle that ended an era, while setting in motion the forces that contributed in various ways to that next European war. Waterloo will always have a place in history and continues to provide valuable lessons to succeeding generations. We remember Wellington’s stunning victory, which propelled him to a successful career in British politics, including Prime Minister, as well as a man exiled in defeat, having once come close to being the master of Europe. How different Europe might be were it not for one battle 200 years ago. Frederick C. Schneid, editor. 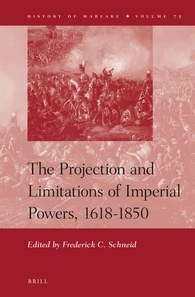 The Projection and Limitations of Imperial Powers, 1618-1850. History of Warfare series. Leiden, The Netherlands: Brill, 2012. ISBN 978-90-04-22671-5. Notes. Index. Pp. xiv, 224. $144.00 (hardcover). Dr Frederick C. Schneid, Professor of History and Chair of the Department of History at High Point University, presents a collection of essays from the Gunther E. Rothenberg Seminars in Military History held at High Point University in North Carolina. Schneid is a historian of the Napoleonic Wars and Wars of Italian Independence. His studies include Soldiers of Napoleon’s Kingdom of Italy: Army, State and Society, 1800-1815 (1995), Napoleon’s Italian Campaigns, 1805-1815 (2002), and Napoleon’s Conquest of Europe: The War of the Third Coalition (2005), Napoleonic Wars (2012), and The Second War of Italian Unification, 1859-1861 (2012). Jeremy Black. War in European History, 1494-1660. The Essential Bibliography Series. Dulles, Virginia. : Potomac Books, 2006. ISBN 978-1-57488-971-0. Pp. x, 118. $14.95. Jeremy Black. War in European History, 1660-1792. The Essential Bibliography Series. Dulles, Virginia: Potomac Books, 2009. ISBN 978-1-59797-246-8. Pp. x, 112. $14.95. Frederick C. Schneid. Napoleonic Wars. The Essential Bibliography Series. Dulles, Virginia: Potomac Books, 2012. ISBN 978-1-59797-209-3. Pp. xii, 121. $14.95. On Monday, September 13 at 9PM Central Time (check local listings), PBS will air a documentary on one of the more unique and important figures from the Revolutionary War, the Marquis de Lafayette. Lafayette was a French noble, who came to fight for the American cause at only 19. Lafayette: The Lost Hero presents the intimate story of the man who served as major-general in the Continental Army, and was a close friend of George Washington. The story of Lafayette involves struggle and troubles, as while he is from a noble family, he strives to prove himself in French aristocratic society. He marries Adrienne, daughter of French aristocrats in 1775. In his youth, he became enamored with the idea of liberty and found sympathy with the American cause, which motivated him to travel to America, leaving a pregnant Adrienne in France. The Revolution is but one part of the whole story. Lafayette’s life after the Revolution is covered very well, including his role in the French Revolution, imprisonment in France and Austria, and return to America to a hero’s welcome in 1824-5. The interesting aspects of this film are the love between him and Adrienne, as well as how both France and the United States have seemed to forget Lafayette (an example given was a statue of him donated by American schoolchildren being moved from the center of Paris to an obscure park). Through wonderful use of living history demonstrations, interviews with scholars and descendants of the Marquis, and wonderful use of images and animations, Lafayette: The Lost Hero is a documentary that you should record and watch. Lafayette: The Lost Hero from The Documentary Group on Vimeo. Click here for images and information on the documentary from the PBS website.